it’s true … i’ve never made a pie before. i decided to attempt my first pie, pumpkin and fearless. using store bought pie crust. i know, baby steps. i crafted this beautiful crust. it was easier than it looked. and totally worth it. i used canned pumpkin, which she once told me was ok, and her word is gold. i followed the recipe on the back of the can with minor changes to the spices used. it turned out better than expected. beautiful and delicious. really delicious. and really beautiful. i did it. i made pie! You made pie!! awesome! I always use ready made crust, lol. Your braid is beeyootiful! good job, I can almost smell it through the screen..can’t wait for Thankgiving. Wow – that’s some first-try pie! Beautiful crust. This is my first comment – really enjoying your blog. Whoah, your first pie has a crust like that?! So beautiful! Love that braided edge – so pretty! I’m pinning that beauty! The braided crust makes it look so professional! It looks really good! Yummy & beautiful! What more could I want in a pie!? How could this possibly look this good? Huh? It’s beautiful – like something out of a magazine. That braided crust is fabulous. I have made pie but they never look good. Mostly cause I’m impatient and don’t take the time with the crust. But they are still tasty. PS – Try the Pioneer Woman’s crust. It is awesome and pretty simple. 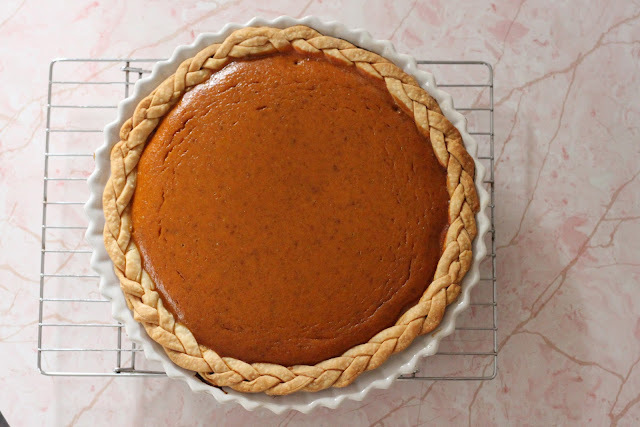 THAT my dear, is THE most beautiful pumpkin pie I have ever laid eyes on. Heck, I’ve never even ever made a pie. Yours turned out perfectly delectable. It also photographed beautifully. Congratulations! My hat’s off to you, my friend. Were you one of those kids who didn’t talk until you could say a perfect sentence? Cuz seriously, that pie is beautiful! It looks like you’ve made hundreds! I’ve never seen a pie with a braided crust before! Great WOW factor there. Well done! Yay for you! You make me want to go make one myself. I’m enjoying reading your back posts. I like your style, short and sweet and to the point. It looks fantastic! I would love to make pie too, but have never tried. I love the braiding! I’m a pie fanatic! I’ll be making 7 pies this Thanksgiving! But I’ve always wanted to do the braid border crust and you convinced me to! Yours looks GORGEOUS! Check out the Pioneer Woman if you haven’t yet. AND her pie crust recipe. P.S. You should start celebrating annual Pi DAY every March 14th (3.14)=pi. And EVERYONE makes pie’s on Pi day! Get on the band wagon Michael! Bravo!! When I discovered I couldn’t make perfect pie crust like my mom could, I learned to use store bought. Nothing at all wrong with that. Yours is absolutely beautiful and I am going to try the braid around the edge. thanks for posting. I wish you made a video showing how you did that braiding process. How long did you make the strips. I agree with all the comments. I have another adjective: Elegant.